Sunridge Retreats, Holiday Accommodation with Fishing & Hot Tub in Devon. Sunridge Retreats is a secluded cluster of luxury holiday escapes based in the South Hams, Devon, UK. Established over 30 years ago, Sunridge provides a ravishing rural retreat to suit everyone. Whether you want to relax amongst the branches of our enchanted TREEHOUSE, cosy up in our spacious stone-bordered LODGE, spread out in our huge 10 metre GEODOME, get all bespoke in our bijou ECOPOD, or go back to canvas in a luxury GLAMPING bell tent (ding-dong!) - there really is something at Sunridge Retreats to suit every taste and budget. Set amid 4 acres of beautiful tree-studded Devonshire countryside, each of our UK based luxury retreats is carefully situated to provide the perfect combination of comfort and seclusion. But to say you wont have neighbours is not entirely true - a beguiling assortment of local wildlife awaits (this is their home too remember!). It’s not uncommon to see a squirrel cartwheeling across the Treehouse decking! The private coarse fishing lake, stocked with an abundance of vigorous carp, is for the exclusive use of our Sunridge guests. (Note: the EcoPod and Glamping do not have access to the lake unless by prior arrangement). Located in the rural heart of the South West region in Devon, Sunridge Retreats is only a short drive from Dartmoor National Park and the Salcombe Coast. The only decision you have to make now is which of our luxury holiday accommodation retreats to book! Please CONTACT US for booking any of our retreats, or take the time to visit each of the accommodation areas in more detail. Sunridge Lodge is a cosy Devon holiday lodge with all the trimmings! Originally a dairy barn it has been reinvented with modern interiors, log burner, german kitchen, underfloor heating, power shower, 3D home cinema and of course the mood lit hot tub is just a hop, skip and a jump away! Everything was perfect, the scenery is absolutely beautiful and the lodge is AMAZING!!!! Stayed at the EcoPod recently to celebrate a friends birthday. 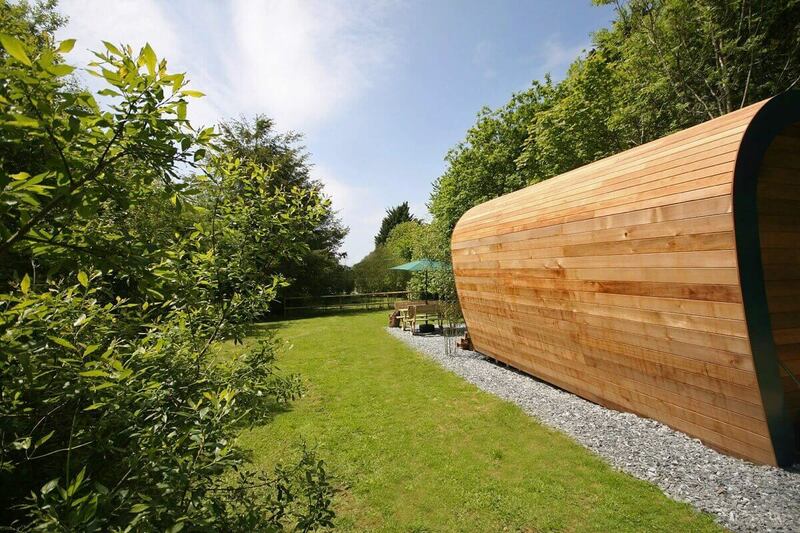 The surroundings were stunning and the bespoke pod itself was gorgeous. The hot tub was the icing on the cake. The only thing we didn't like was leaving! If you want to get cosy under canvas then these 2 luxury bell tents in Devon are up for grabs! Camping doesn't always have to be a chore; and with seagrass carpets, a double bed, twinkly lights, power sockets, free wifi and a luxury underfloor heated shower room - you can embrace what glamping life is all about! Sunridge Retreats provide 5 unique areas of secluded accommodation. We have a Treehouse, Lodge, Geodome, Ecopod & Glamping area. Individual private hot tubs are included with the Treehouse, Lodge, Geodome and EcoPod. (excluding the glamping tents). Every retreat is varied on pricing to cater for different budgets. Singles, Couples, families, parties, friends who fish. All year. Winter time in a hot tub is magical!